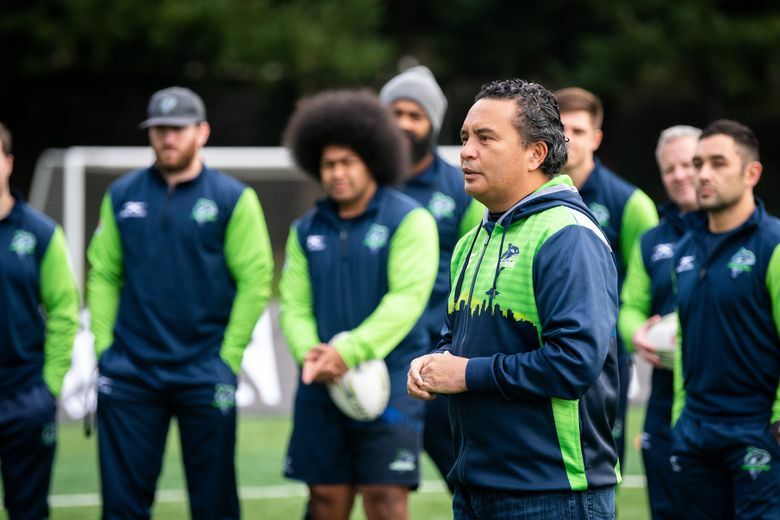 The Seawolves, Seattle’s pro rugby team, start their second Major League Rugby season with something they didn’t have last year: a full-time coach. Foiled by the U.S. Citizenship and Immigration Services in getting visas for two foreign coaches, the Seawolves turned over coaching duties to player Phil Mack, who led the Seawolves to a 10-2 season, the league’s inaugural championship and a nomination as Seattle’s Male Sports Star of the Year. Now Richie Walker, named coach this week, has a chance to match Mack’s success. “We’re coming off last year in a good place, and I hope my influence, a coach’s voice and my looking at micro things, will keep us there,” Walker said. In 2016, he coached the United States women’s team to the Olympics, where it lost in the quarterfinals to New Zealand, Walker’s home country. He was also an assistant coach for the U.S. men’s team. He played rugby in New Zealand and in San Diego after moving to the U.S. in 1994. The two games the Seawolves lost last year were to the Glendale (Colo.) Raptors, the team they beat in July’s championship game. The first game of the 2019 season, 7:30 p.m. Sunday at standing-room-only Starfire Stadium in Tukwila, will be a rematch of the championship. With Major League Rugby expanding to New York City and Toronto this year, the Seawolves will play eight home games at Starfire as part of a 16-game regular season. The semifinal and final games are June 8 and June 16. All Seawolves games will be shown on either CBS Sports Network or on ROOT Sports. Mack sees the league’s expansion and the addition of a Canadian team as rugby “going in the right direction” in North America. He says he’s more excited about the team’s championship as the Sports Story of the Year than his own individual nomination. The MTR Western 2018 Sports Star of the Year Awards have been presented since 1936 and will be given this year on Feb. 7 at the Sheraton Grand Seattle hotel. Walker takes over the team with many of the same players from last year. But there have been some key replacements, including a backup for Mack, who hopes to represent Canada as it prepares for this fall’s 2019 Rugby World Cup in Japan. Juan-Philip Smith, who can fill in for Mack at scrum half, trained and played professionally with three teams in South Africa. “We have a full representation of all rugby nations,” Mack said. That would include South Africa, New Zealand, Australia, Fiji and also a team from Central Washington University, where five Seawolves play, including Vili Toluta’u, who was the MVP in last year’s championship game. The Seawolves will have two brothers playing for them this season as Roland Suniula moves from Austin’s MLR team to join his brother Shalom. He joined the Seawolves, leaving behind one Suniula brother and last year’s teammate, Andrew, in Austin. Mack, who remains the assistant coach, said he’s glad he had a chance to practice his coaching skills and would like to do that professionally in the future. He plans to retire from international play after the World Cup. “That could extend my playing time here,” Mack said.